This utility is only for use with the Sony® TA-ZH1ES Headphone Amplifier. Do not install this utility with any other model. WARNING: Durring this update process, do not turn off the amplifier or disconnect the USB cable connecting the amplifier to the computer. WARNING: Durring this update process, do not use the amplifier or the remote control. Download the Sony Headphone Amplifier Updater(Win)_v1.0.3.zip file to a temporary or download directory (please note this directory for reference). Go to the directory where the file was downloaded and verify that the size of the Sony Headphone Amplifier Updater(Win)_v1.0.3.zip file is 315,184 bytes. Right-click the Sony Headphone Amplifier Updater(Win)_v1.0.3.zip file, and click Properties. On the Sony Headphone Amplifier Updater(Win)_v1.0.3.zip Properties screen, verify that the Size: listed is 307 KB (315,184 bytes). If the file size is different than 315,184 bytes, please download the Sony Headphone Amplifier Updater(Win)_v1.0.3.zip file again. Connect the amplifier player to the computer using the supplied USB cable. 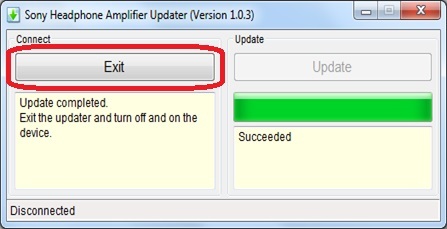 WARNING: Do not disconnect the amplifier from the computer while the update during this process. Turn on the amplifier and set the input to PC(USB-B). 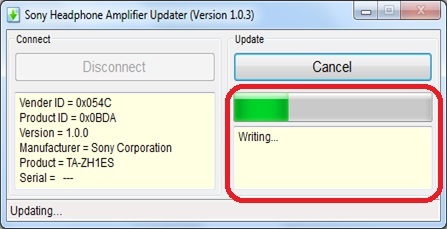 Double-click the Sony Headphone Amplifier Updater(Win)_v1.0.3.zip file. In the Sony Headphone Amplifier Updater(Win)_v1.0.3.zip window, double-click the Sony Headphone Amplifier Updater(Win) file folder. In the Sony Headphone Amplifier Updater(Win) file folder window, double-click the Sony Headphone Amplifier Updater(Win).exe file. 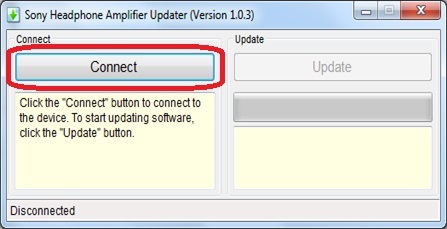 In the Sony Headphone Amplifier Updater (version 1.0.3) screen, click the Connect button. In the screen that is displayed, the current version of the software will be displayed. Once the update starts, the screen will change to show a progress bar. When the update is complete, the progress bar will display a Succeeded message and you should click the Exit button. Turn the amplifier off, leave it off for 30 seconds, and then turn it back on. Note: The update process in now complete. 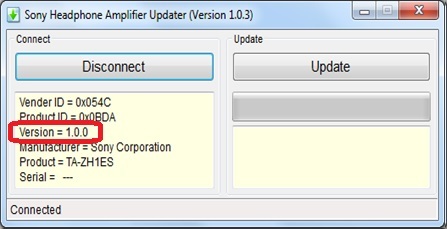 Double-click the Sony Headphone Amplifier Updater(Win)_v1.0.3.exe file. 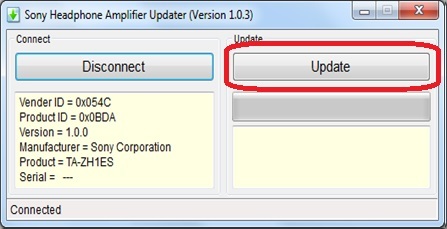 In the Sony Headphone Amplifier Updater (version 1.0.3) screen, the current version of the software will now be 1.0.3. Note: If the version dispalyed is not 1.0.3, repeat this entire procedure again.